In the morning I spend some time at the Tourism Service Center. I want to make a long walk in the Debarwa surroundings, but I find it difficult / impossible to get a travel permit, because I cannot specify my mode of transport to the final destination, which is a dam some ten kilometers from Debarwa. I feel strong to walk the distance, but without a properly specified mode of transport (other than my two feet) I will not receive a travel permit to visit the Debarba surroundings. Therefore I have to skip this part of my itinerary and change the program from a countryside walk to strolling the streets of Asmara. BBRSSY! Impossible to pronounce, but Bbrssy Donut House is my favorite place to visit for a donut, a mini pizza, cheese bread or cake (one should carry as a gift when invited for a coffee ceremony or simply to surprise your host). Bbrssy Donut House also is the place to order a personalized birthday- or whatever you want to celebrate cake. 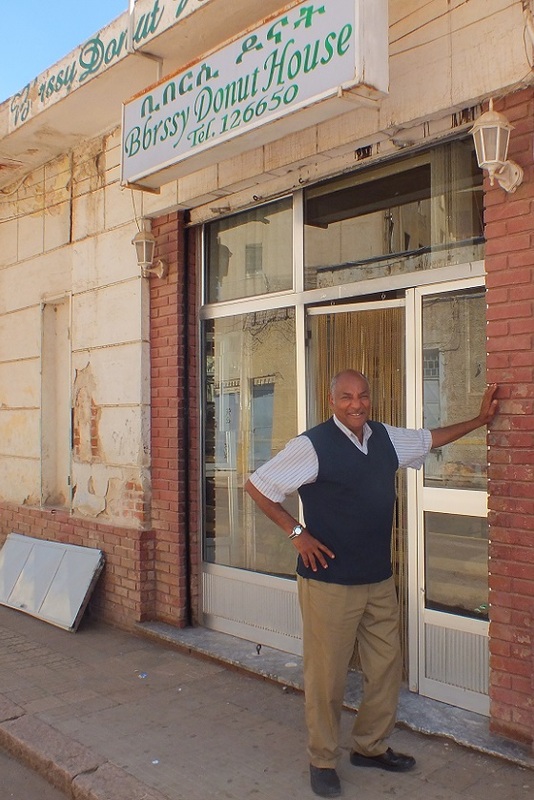 The shop and bakery are located just behind the Ambassador Hotel on Harnet Avenue, so you have no arguments to miss it when exploring Asmara. After my mini lunch at Bbrssy's I enjoy a drink in front of the Denden Club bar around the corner, thinking of a nice program for the afternoon. Usualy my itinerary is a mix of public, religious, or family holidays, but this years visit to Eritrea had to fit the agenda of my employer, resulting in a virtually empty agenda. So I memorize my best memories, and decide to walk to the Medeber markets, a few blocks behind the Nda Mariam Coptic Church. 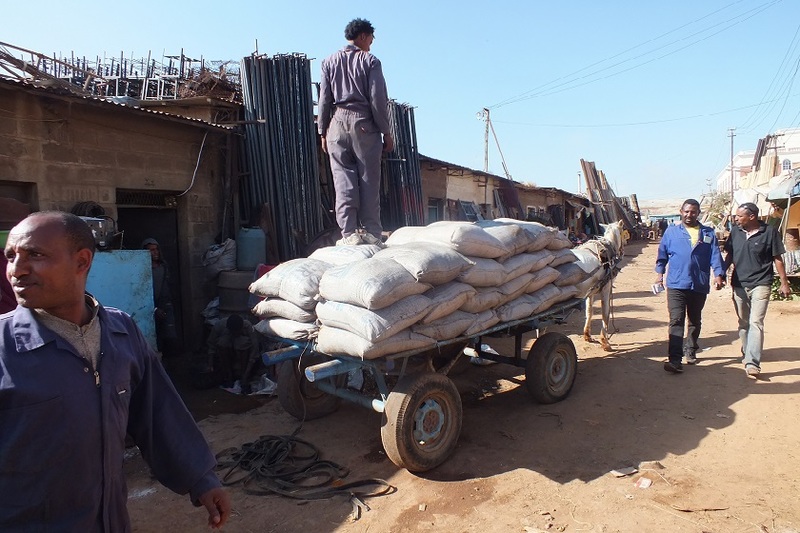 When I think of hard working people, I think of Eritrea. And I am thinking of the Medeber markets in particular. A long time ago Medeber used to be a logistics center for traders of various merchandise. 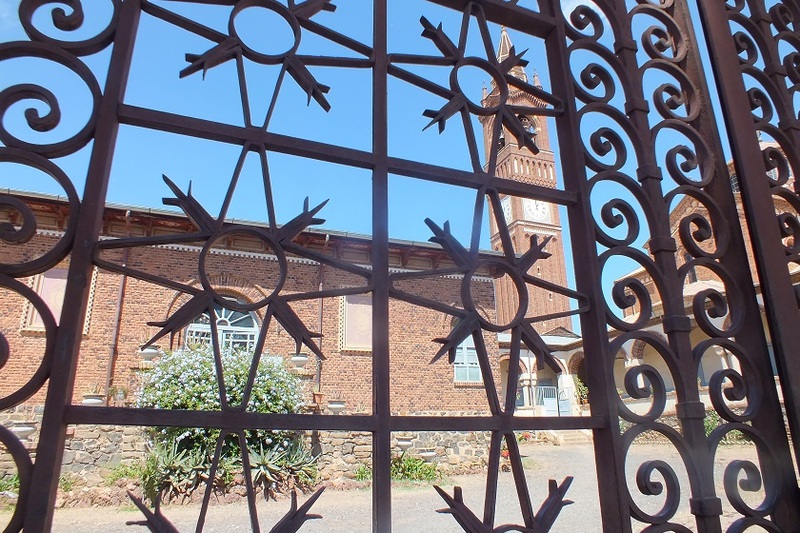 Now it is an immense compound with many workshops where new and used steel is reshaped into all kinds of useful items, ranging from household utilities to iron gates and fences for the Asmara houses and gardens. Wood is processed into furniture. There is small scale shoe production. Chilli pepers are grinded and blended into a spices mix called berbere that will be a basic ingredient to many recipes for the dishes of the Eritrean kitchen. The sound of grinding mills, and clanging iron on iron make Medeber one diverse factory showing an overwhelming activity. It is a typical mix of hard labor and survival. 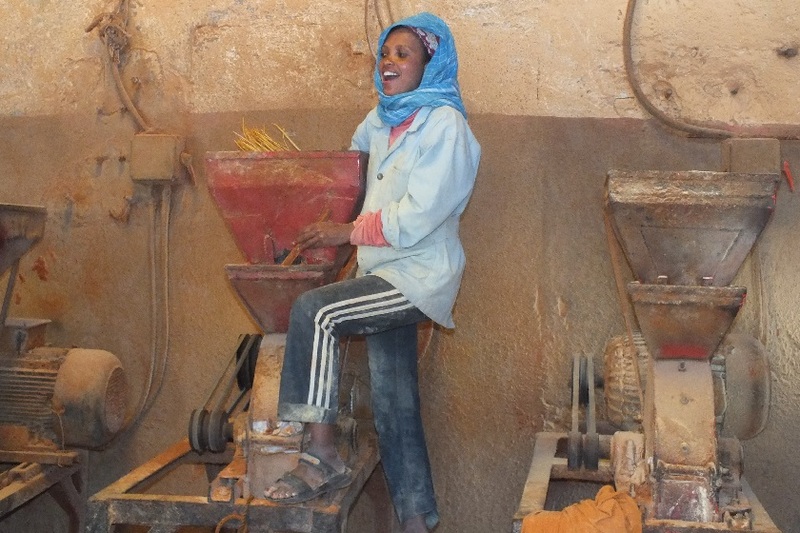 In the 30 year struggle for independence the Eritreans developed the skils to use and re-use and re-use again, producing and repairing their equipment in the rough mountains of the Sahel around Nacfa. Abandoned and betrayed by the rest of the world. The struggle resulted in a people used to work for their money, instead of ending as a beggars nation. It resulted in self reliance, import sustitution, and pride. I love to visit this extraordinary place to watch its activity and to interact with the workers who are both friendly and proud. When I enter one of the berbere workshops, one of the female workers asks me for chewing gum (mastika). So stupid of me. At the gate I saw a lady selling the product. I return to the gate to buy ten packages of mastika to share with the girls (and the men in the other workshops). First sow, than reap. Back in the workshop I hand slices of chewing gum to all the girls. I play with my camera sitting on a small wooden stool in the workshop. Some girls hide for the camera, and some don't. I show them the pictures. They have to laugh. No problem to make more photo's. After half an hour I have a nice set of pictures of various men and women performing their daily jobs. One of the workshops serves as a tea shop. 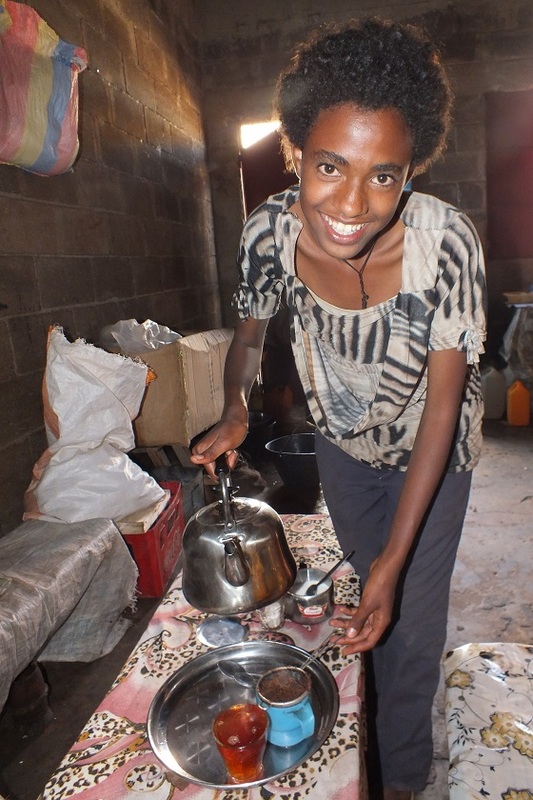 For three Nakfa (mother) Harega and (daughter) Zibiba serve delicious fresh tea. I take some time to rest and recover from the spices dust that will cause you to cough and sputter. The women look proud that the tourist found their place to have his drink. No problem to make a picture when Zibiba is serving my tea. Ghenet (waitress at the Denden Club) - Asmara Eritrea. Bereket, owner of Bbrssy Donut House. 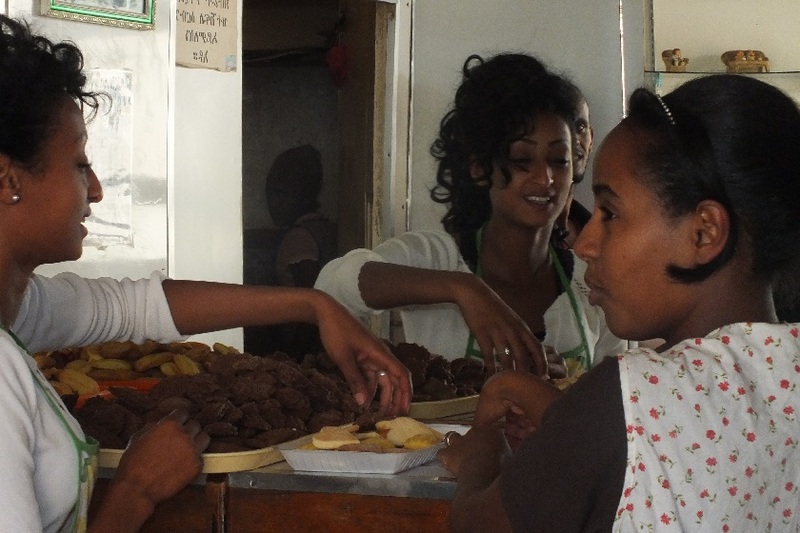 Workers of Bbrssy Donut House - Asmara Eritrea. 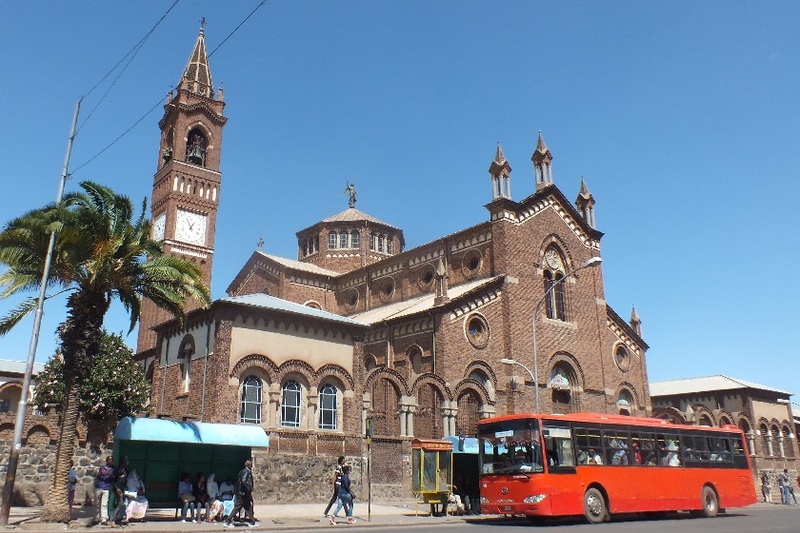 Catholic Cathedral - Harnet Avenue Asmara Eritrea. 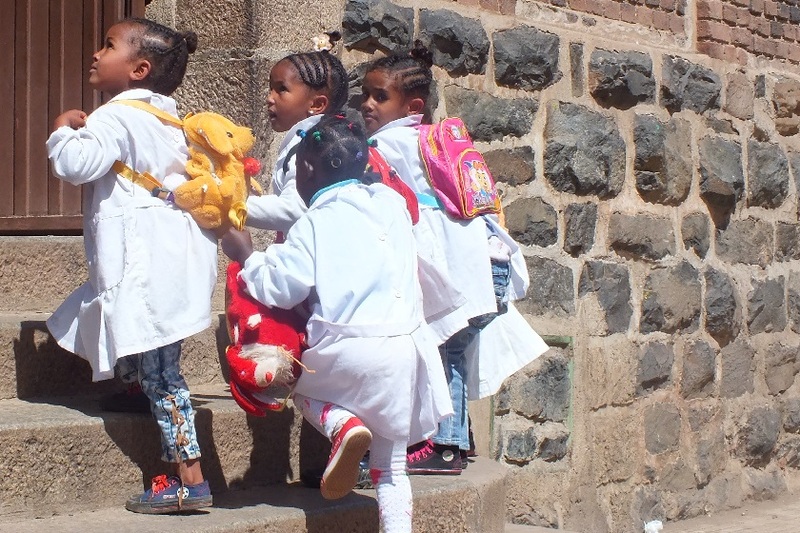 Entrance of the catholic childcare - Harnet Avenue Asmara Eritrea. Bus stop Nda Mariam Coptic Cathedral - Asmara Eritrea. 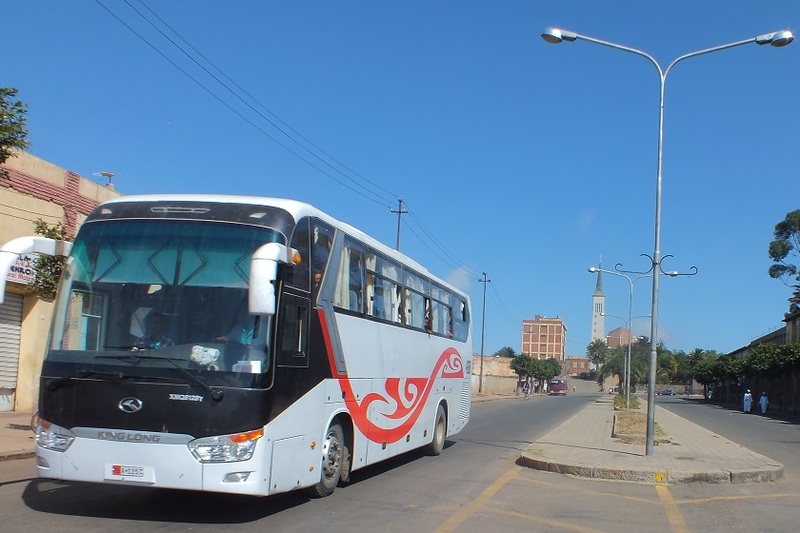 Harat intercity bus (from Massawa) - Afabet Avenue Asmara Eritrea. 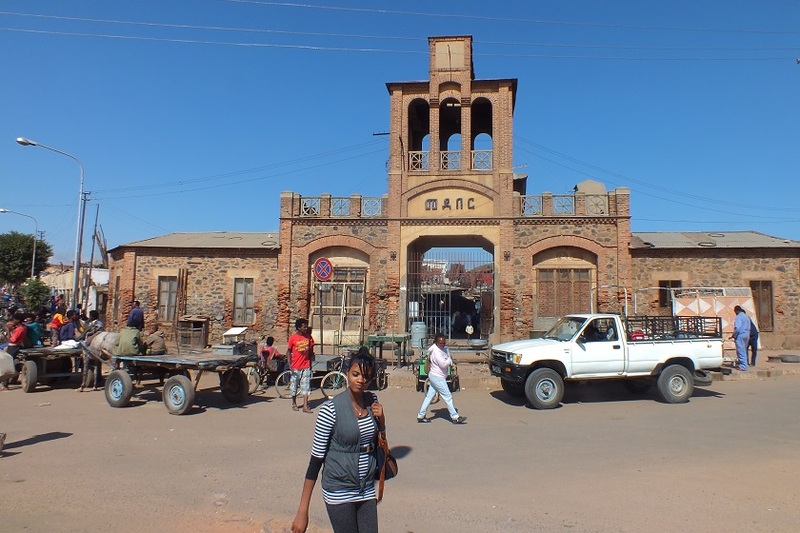 Entrance of Medeber markets and workshops - Medeber Asmara Eritrea. Woman grinding spices (berbere) - Medeber Asmara Eritrea. 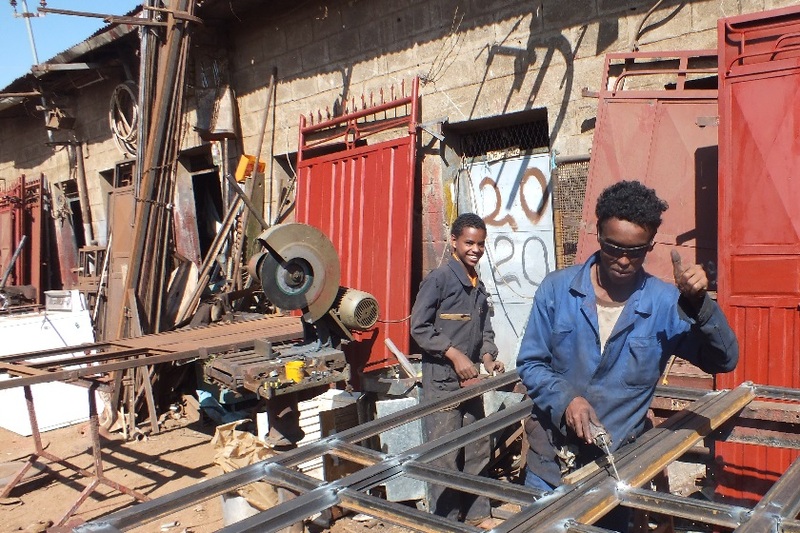 Welding perimeter gate doors - Medeber Asmara Eritrea. 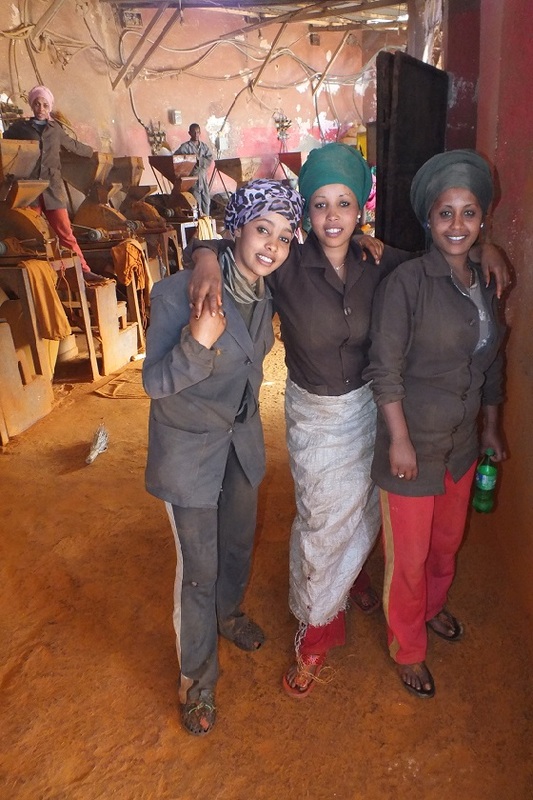 Workers of the berbere workshop - Medeber Asmara Eritrea. 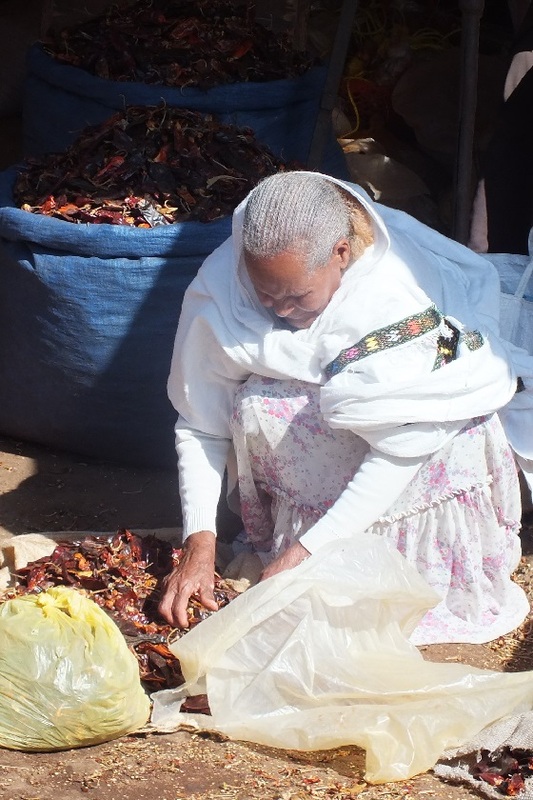 Woman refining the chili's - Medeber Asmara Eritrea. 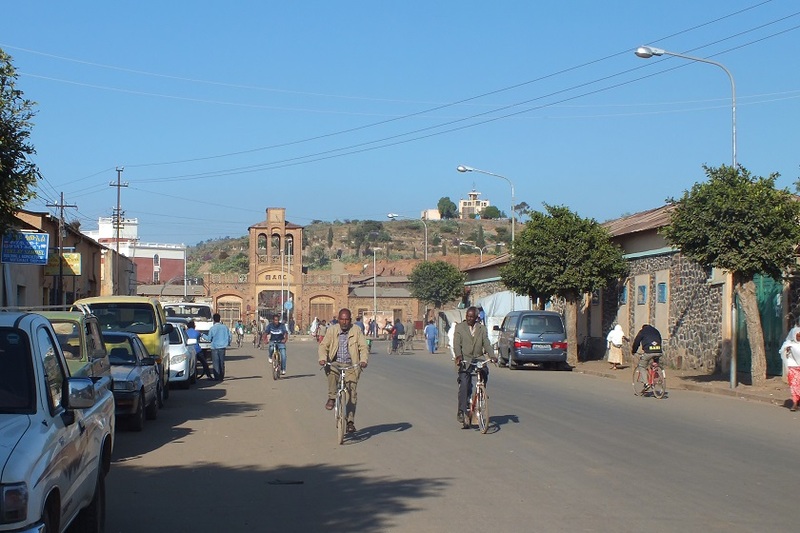 Local scenery - Medeber markets Asmara Eritrea. 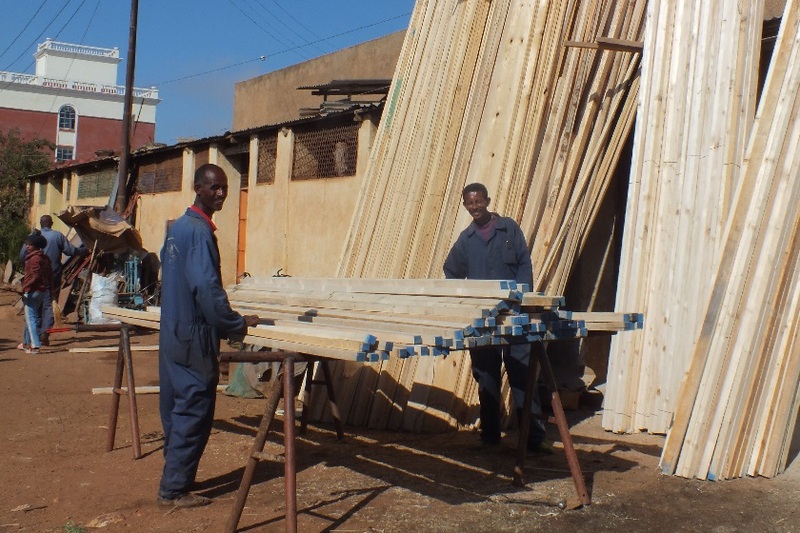 Wood workshop - Medeber markets Asmara Eritrea. 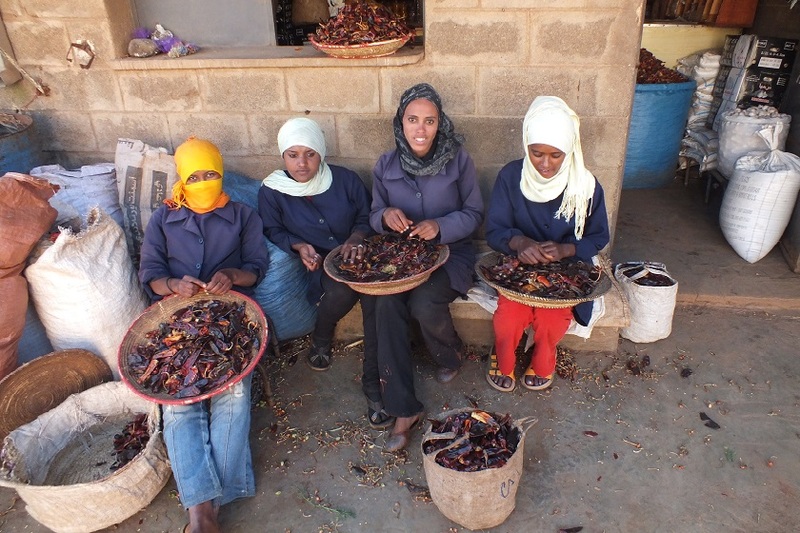 Women refining the chili's - Medeber Asmara Eritrea. 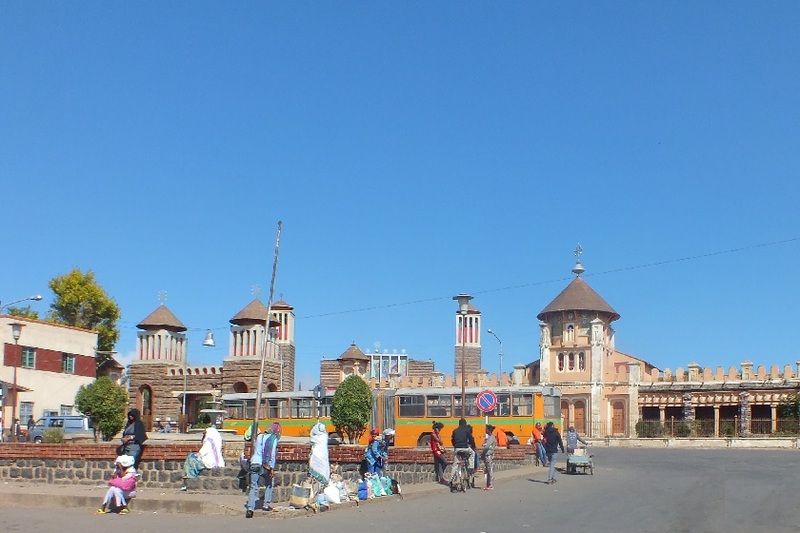 Tea bar - Medeber markets Asmara Eritrea. 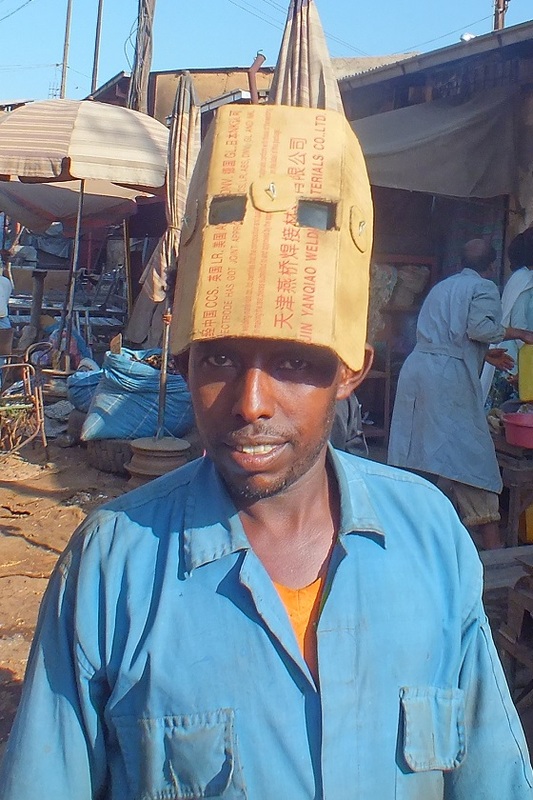 Worker - Medeber markets Asmara Eritrea. 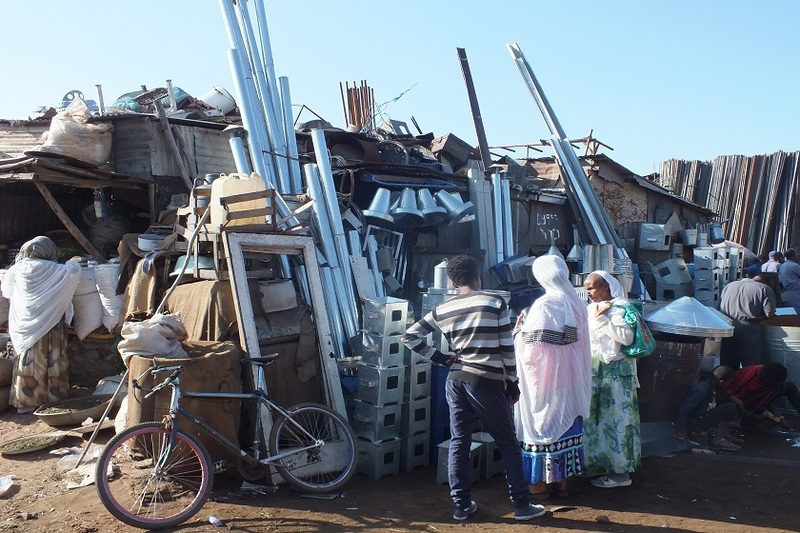 Alu household utensils and building materials - Medeber Asmara Eritrea.